Calling all Ramahniks! Do you know of anyone considering Camp Ramah for kayitz (summer) 2020? Please invite them to join us this summer at camp in Palmer for our Prospective Family Day from 10:30am to 2:00 pm on Sunday, July 14, OR Sunday, August 4, 2019!!!! Come see for yourself where all of the Ramah magic happens! Check out our beautiful lake, expansive sports fields, vibrant arts and crafts and woodworking studios, our thrilling ropes and adventure course and so much more. Tour our spacious bunks and see where our campers eat, pray and play! Learn about the unique Jewish education program which enables our campers to learn Hebrew and study their Jewish heritage in an informal setting. 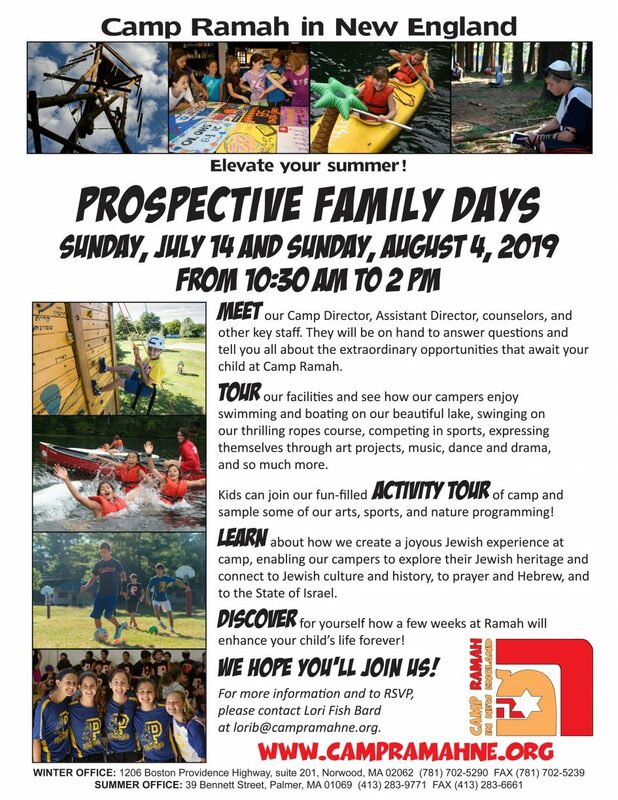 Meet the Director, Assistant Director and other key staff who will be there to answer questions and tell you about the extraordinary opportunities that await your child at Camp Ramah. Camp Ramah offers two-week sessions for children currently in grades 2-3 and four or eight-week sessions for children in grades 3-10.